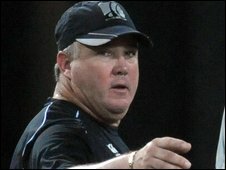 New Zealand Cricket officials have backed coach Andy Moles after reports claimed his position was in jeopardy. Chief executive Justin Vaughan released a statement confirming Moles, 48, would remain in charge and was preparing for their upcoming series against Pakistan. But he hinted changes may be possible and revealed officials were planning to conduct a thorough review of the team. "It will look at all aspects of individual and collective performance with a view to improvement," he said. Reports in the New Zealand media said that unnamed senior players had wanted Moles, a former coach of Scotland, removed from his job. The former Warwickshire batsman succeeded John Bracewell as New Zealand coach in November 2008 but the team's form has been patchy since then, drawing four Tests and losing three and being beaten in 10 out of 19 one-day internationals. New Zealand reached the recent ICC Champions Trophy final, but lost to Australia. Meanwhile, Black Caps skipper Daniel Vettori won three honours at the annual New Zealand Cricket awards. The left-arm spinner, who has taken more than 300 Test wickets and scored over 3,000 runs, picked up the player of the year, first-class bowler of the year and the all-rounder trophy. "Daniel has been an inspiration to his team and to New Zealand cricket fans," said Vaughan. The Kiwis next face Pakistan in a five-game one-day international series in the United Arab Emirates, beginning on 3 November.